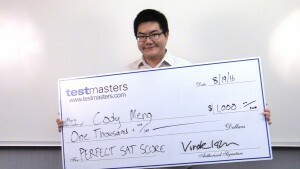 HOUSTON, TX (August 19, 2016) Cody Meng, a rising senior at the Kinkaid School, has joined the very best test-takers in the world, and an increasingly impressive number of Testmasters alumni, achieving a perfect score on the December 2015 administration of the SAT. Meng’s score places him in the top 1% of test-takers. He credits his success in part to his time as a Testmasters student, having twice completed a full length Testmasters SAT course, once as a 6th grader and once again before 11th grade. In recognition of his accomplishment, Testmasters will award Meng a $1000 Perfect Score Scholarship.